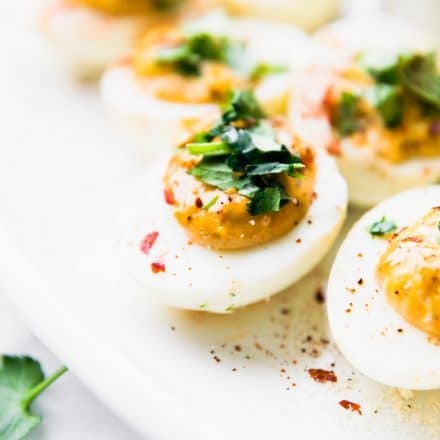 This easy deviled eggs recipe makes a healthy party appetizer with a kick of spice! It’s an easy eggs recipe made with paleo and Whole30 chipotle mayo. Gluten-free, grain-free, and low carb, too! Extra optional toppings/seasonings – sea salt flakes, paprika, and/or red pepper chili pepper seasoning, jalapeño, etc. olive oil. Slice your peeled (cooled) hard boiled eggs vertically. Scoop out the yolk and place in a mixing bowl. Mix in chipotle mayo, ground mustard, garlic, pinch of red pepper flakes, and splash of lime juice. (see notes for making a quick version or substitutes). Mix until with a fork or spoon until egg mixture is smooth. Season with salt/pepper to taste and mix again. Taste and see if it’s salty enough, if not, add a dash more salt and pepper. Scoop 1/2 tbsp to 1 tbsp of deviled egg yolk mix into your egg white halves. You may also use a piping bag for a cleaner looks. Sprinkle each egg with paprika or chili flakes after. If you are making 12 dozen eggs, just double the recipe but add in the salt 1/4 tsp at a time and taste to make sure it’s not too salty. If you can’t find pre-made hard boiled eggs, you can purchase Eggland’s Best brown eggs and follow their tutorial on HOW to MAKE the PERFECT HARD BOILED EGGS. If you don’t have chipotle mayo, you may use your favorite paleo mayo mixed with pinch of Chipotle chili seasoning or 1 tbsp + chili/chipotle sauce.